More than 700 Hamilton Middle School students participated in a recent mock election at their school, casting votes for U.S. President and various ballot initiatives. The event was part of a mock election for students statewide, said Susan McRoberts, teacher librarian at Hamilton. By participating, students became more aware of the issues in this year's election and looked forward to comparing their votes to this week's election outcomes. 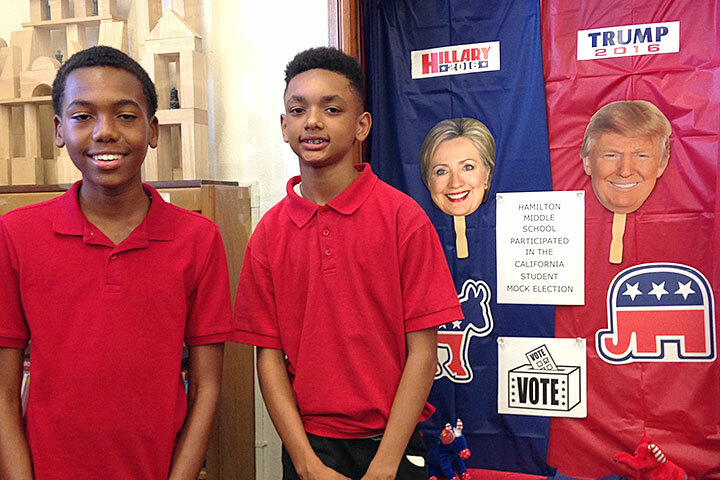 LEARNING TO VOTE - Hamilton Middle School students Keon Valentine and Darnell Hurd pose with a school display urging students to vote.